Aleksandar Joksimovic and Jelena Nikolic are from Serbia and designed Noah’s Ark, a sustainable floating city, for the 2012 eVolo Skyscraper Competition. Their hope was to design a safe and self-sustaining world that could be used in the event that natural disasters or other global catastrophes destroyed our homes. Moving to the ocean, the duo envisioned a post-apocalyptic human race living off of the ocean. Noah’s Ark is a series of terraced rings with deep underwater towers that act as ballasts to increase stability. Multiple arks could also be connected together in a network through underwater cables. 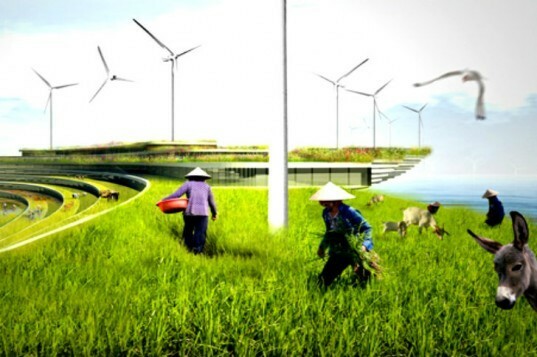 Solar, wind and ocean energy are harvested to generate power for the floating city, while rainwater is collected from all the surfaces for use within. Underwater turbines could capture tidal energy and all of the surfaces would be covered in artificial coral to encourage sea life. The sides of these artificial islands are tall enough to protect the interiors from severe storms or tsunamis. In the event of a major storm or impending disasters, the inhabitants can retreat to air-filled bubbles inside the depths of the islands for protection. Each ark features residences, offices, farmland, animal preserves, energy generation capabilities, and recreational spaces. Aleksandar Joksimovic and Jelena Nikolic are from Serbia and designed Noah's Ark, a sustainable floating city, for the 2012 eVolo Skyscraper Competition. Their vision was to design a safe and self-sustaining world that could be used in the event that natural disasters or other global catastrophes destroyed our homes. Moving to the ocean, the duo envisioned we could begin again fresh and live off the ocean. Noah's Ark is a series of terraced rings with deep underwater towers that act as ballast to increase stability. 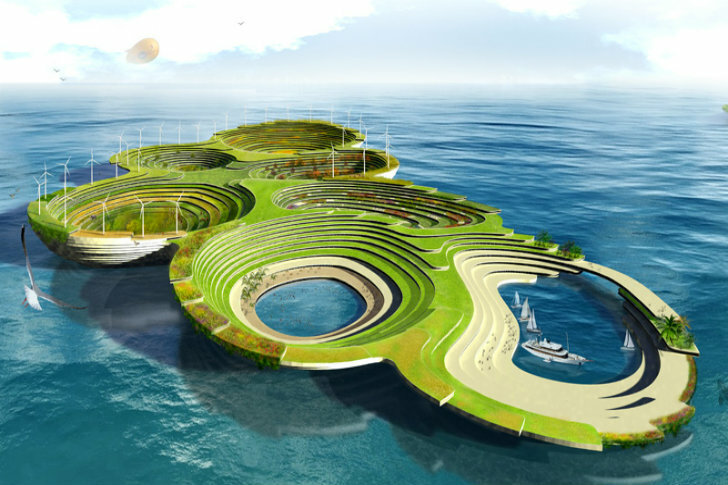 Solar, wind and ocean energy are harvested to generate power for the floating city, while rainwater is collected from all the surfaces for use within. Underwater, large turbines capture tidal energy and all of the surfaces are covered in artificial coral to encourage sea life. Each Ark features residences, office, farmland, animal preserves, energy generation, and recreational spaces. Multiple Ark's are connected together in a network through underwater cables.